Very over-rated. Lovely and stunning special effects. They get 5/5. What else can I say about this movie? Not much, I'm afraid. I think they thought they were being very 'deep' and 'meaningful'. It's really just some spectacular views of the Earth from space. 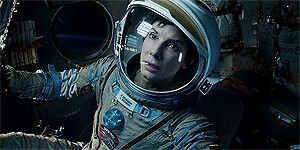 They try to develop a vaguely spiritual / recovering from depression / life-affirming kind of theme - but, let's face it, Sandra Bullock was never going to pull that off. Apart from the 3D spectacle - I was slightly bored. PS. The Tips & Guidelines for this feedback slot suggest they want us to comment on the cinema, not on the film. Bit odd.